Welcome to St Mary Magdalene's, Dundee! We are a Scottish Episcopal Church in the Diocese of Brechin, part of the world-wide Anglican Communion. Our church is located in the heart of Dundee, drawing its congregation from across the city and from Forfar, Arbroath and Fife. At St Mary Magdalene's you will receive a warm welcome: we are a friendly and inclusive community who seek to live out our faith in Jesus Christ in all that we do. Our worship centres on the Eucharist. The four services each week are conducted in a traditional manner, which is enhanced at our main 11.00 am Sunday service by choral settings and anthems. More information about our services is available on the future services pages of our website. Although reverent, our services are not stuffy, and we provide a well-attended young church for children up to eleven years of age at our main Sunday service. During special times in the church calendar — for example, Christmas and Easter — we have additional services. Our wider church life also includes the Study Group and Women's Guild, which have varied and interesting programmes, and are described elsewhere on this website. 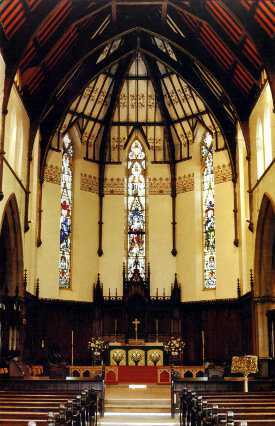 St Mary Magdalene's Episcopal Church is a beautiful building — a larger image of the interior of the Church can be found by clicking on the photograph above. Many Dundonians find the Church appropriate for weddings and other major personal and family events: if you are interested, please do contact us. A large part of our pastoral ministry in Dundee is based around visiting the sick and the housebound. If someone you know is in need of care, we would be happy to assist. The following telephone numbers are all local Dundee landlines — area code 01382 — except where otherwise indicated.